When I first came across this term 'Flemish Primitives' I did not understand a bit. Was it something to do with archaeology? Actually nope! Not, thaaat primitive. They're just talking about 15-16th C CE. Well, the terminology was assigned in 1902 as the name of an exhibition of about 400 such paintings that held in Bruges. Primitive is more associated with the style of the paintings which was more soft, fluid Christian in feel. The realism in these painting were mind blowing, esp., in their depiction of fabrics, fur, metals & precious stones. The timeline is the same time as Gothic architecture. This was also called Early or Northern Renaissance and was prevalent all over Belgium, esp Flanders. The main artist of the era is Jan Van Eyck who is one of my favourite artists during my art history days in Uni. 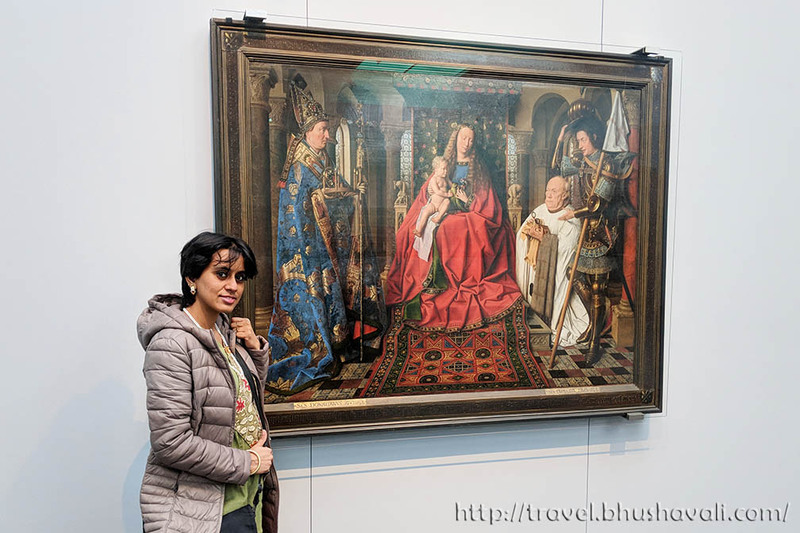 Today the gorgeous pieces of art are scattered all across Bruges - Groeninge Museum, St.John's Hospital, Church of our Lady, St.Savior's Cathedral and more. On day 2 at Bruges, I took off from Hotel Prinsenhof at 9:15AM to reach the OLV Church at its opening time and from there I headed to Groeninge Museum. When I visited, there weren't any temporary exhibition on. The permanent collection, when compared to the various fine arts Museums I've been to, this is relatively small. Like my blog? Support me via Patreon! It costs less than a cuppa coffee! It begins with - no prizes for guessing - obviously, Jan Van Eyck! Here's Virgin and Child with Canon van der Paele from 1434-36 CE (first pic of the post). Another major artist, his contemporary, was Hans Memling. So the first room with filled with both their artworks. From there I headed to St.John's Hospital. A temporary exhibition called Smoke, Ashes, Fable by William Kentridge was on, incl tapestry, animation and more. The permanent collection majorly features Hans Memling. The most important being the altarpiece of John the Evangelist and John the Baptist. It reminded me of the Adoration of Mystic Lamb at Ghent. This altarpiece was commissioned for this chapel in St.John's hospital. Hotels and B&Bs at all price points are available in Brugge City Centre. Here’s my review of Hotel Prinsenhof where I stayed. Local Transport within Bruges is possible with DeLijn buses (and horse carts!). However most sites are walkable. The city does not have metro or tram. Both are included in the Musea Brugge Card. 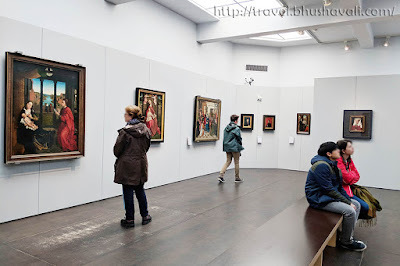 P.S: I was invited by Musea Brugge to experience the city and hosted by Hotel Prinsenhof for review purposes, however the opinions are my own and this post does not to advertise the product/service. This post comes just in time! I will head to Bruges just this weekend. I have been several times, but I never visited the exposition. I will definitely indulge a lot of food, but also see some museums. I don't know much about fine art, but it's interesting to know about Flemish primitives. I'll really check this out when I'm next in Bruges. Great photos of the paintings too. I am the first to admit that I don't know or understand much about fine art or paintings. However I really do appreciate great talent when I see it. The pieces you have included in this post are just gorgeous. If only I had an ounce of their talent! I just love looking at some of these works. I have never heard of Flemish Primitives either. Very interesting! The paintings are actually quite beautiful. This is definitely an exhibit I'd love to see! Holy cow! The painting where he was cutting that guys arm open gave me chills, yikes! Dutch and Flemish painters are always so amazing. I've always loved the works of Rubens, Verneer or Rembrandt but I've never heard of this specific "Primitives paintings". I definitely was familiar with the work of Jan van Eyck, especially Portrait of Giovanni Arnolfini and his Wife, but I never got deeper into the art period. I find the paintings really beautiful and, as you said, the detail in the fabrics and the metals is amazing, specially for that century. I never took art studies beyond a few lessons but I have always loved it, so this was a really enjoyable post for me, thank you! 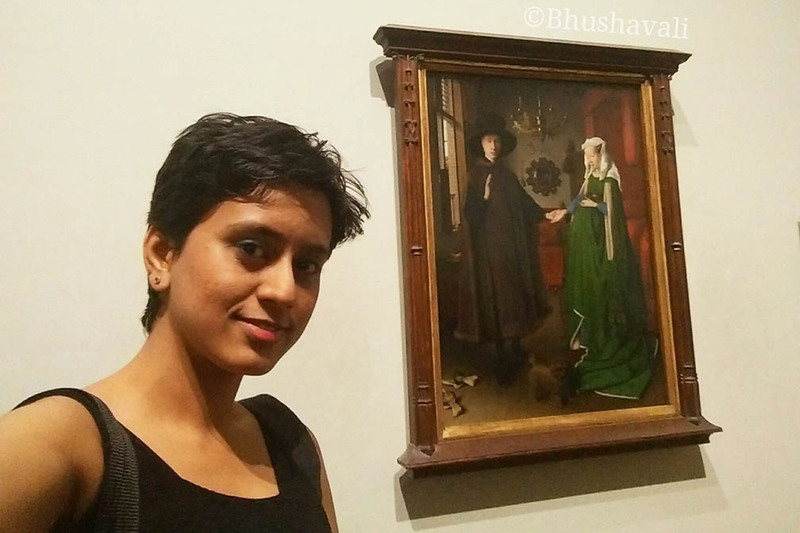 Wow, I couldn't stop gazing to that beautiful painting If I get the chance to be in that place. I love how they would still able to really take care of this piece of work. I as well love how you were able to convey all the information about the paintings. It really gave me an idea and was able to understand the history behind the paintings. I am into photography and paintings always give me inspiration. Analyzing the color palettes and compositions makes you take better pictures. It would be nice to see this gallery life, when I am in Brugge. This article really took me back to my time in Bruges. I very much enjoyed the Groeninge Museum even though the collection is not so big. And I've seen that Van Eyck in the National Gallery in London too! The realism in those paintings is just amazing! I had never heard the term Flemish primitives before bumping into your article. Bruges is really high on my travel bucket list so I hope I will get to indulge in its amazing paintings very soon! Flemish primitives are always interesting art when I see it in the museums. It always seems to have just a bit gruesome when you dig down deep into the paintings. Deep, slightly dark and so interesting. Just another reason to get to Bruges. I thought about some kind of pre-human humanoid when I read Flemish primitives as well! While I must admit that I know near to nothing about art, the paintings do look quite impressive. This is such a nice find. Medieval painting and art have always fascinated me. But this term Flesh Primitives are something really new and even more interesting. We loved our time in Bruges, but didn't have time to check out the Flemish Primitives. I had wondered if we were making a mistake, and now it looks like we need to go back! The detail in those paintings is magnificent, I'm sure it's just incredible to see in person. I love this type of art! It's really beautiful, I've always loved Flemish art. You are right - the textures depicted in this type of art is so real and has such a tactile appearance. But I'm not sure about the one with the guy slicing open the man's arm - eek! I can't tear myself away from Flemish Art when I encounter it in a museum. Thank you for this treat.